Today I welcome Alice Archer to the blog to answer a few questions for Interview³. When I was a kid, if I told my mother I was bored, she’d suggest that I write a poem or read the dictionary. For my thirteenth birthday, a friend of the family gave me a diary, and that was the first of many, many journals I’ve filled over the years. Even though I’m a professional editor, I almost never remember to spell the word acknowledgments correctly. Roald Dahl’s children’s books. I wore out Cher’s Greatest Hits album as a teenager, captivated by the stories told in the songs. The male-male romance genre, for surprising me enough to want to join in. Nancy Lemann’s Lives of the Saints – a weird, lovely book that makes me nostalgic about the U. S. South, where I grew up, even though I never totally fit in there. Ray Bradbury’s Dandelion Wine – because the writing makes me feel drunk. Amy Lane’s Clear Water – one of my favorite male/male romances. I use three software programs to write novels: Scrivener, tweaked to work the way I want it to; Word for Mac, for the one-line-per-chapter synopsis that allows me to see the whole story at a glance; and Excel spreadsheets, for tracking writing times and word counts. My perfect orange armchair from West Elm, or my couch, situated to give me a view of trees. If I write when I’m not at home, the main things I need are to not sit at a desk, and to have a view of nature, which relaxes and inspires me. 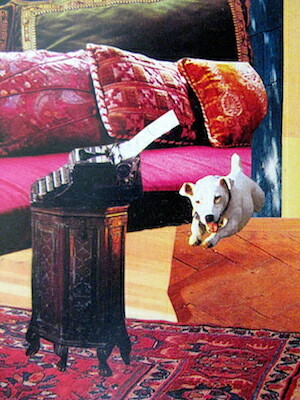 Ultimately, though, putting in the writing time is more important than where I do it. Local writing buddies. Trying out self-publishing. Having all my books about writing in one place (right now they’re in Washington State, Virginia, and Tennessee). I don’t have anything revolutionary to offer, but I stand by the basics, which I’m sure you’ve heard before: Set specific, meaningful writing goals. Write, write, and write some more. Experiment to find out what works for you. Those three tips will take you anywhere you want to go. I’m sure of it. First, I’ll finish the novel I’m currently writing. Also, since I learn so much about the publishing industry in my job (which I love) as an executive at a publishing firm, I plan to apply what I learn to my own writing career. I’ll attend a few writing/publishing conferences, including the Smarter Artist Summit in February, which I’m really looking forward to. 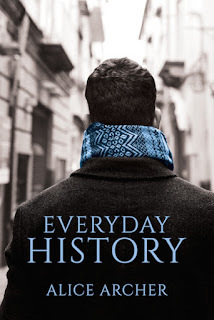 Everyday History, a contemporary male/male romance, tells the story of Ruben, a headstrong young man, who woos, wins, then walks away from an older man, Henry. The articles Henry subsequently writes about their time together compel Ruben to rethink his decision. The themes running through the story include separation, getting lost, growing up, the memories embedded in our belongings, and the pain of believing it's too late to change your mind. Because I write for myself first, the story has a happy ending. If you woo, win, and walk away, a second chance is going to cost you. Alice Archer has messed about with words professionally for many years as an editor and writing coach. After living in more than eighty places and cobbling together a portable lifestyle, she has a lot of story material to sort through. It has reassured her to discover that even though cultural differences get people into a peck of trouble when they’re falling in love, the human heart can find its way in any language.